The most effective use of this unique dental product is stabilization of a lower denture. There are approximately 50,000,000 people in the United States who are "edentulous" (literally meaning lacking teeth) who struggle daily with prosthetic devices. A majority suffer a great deal of discomfort as a result of loose or ill-fitting dentures. Many denture wearers simply withdraw from any type of social engagement as a result of being compelled to wear them. Moreover, it's not uncommon for family members to complain about a denture wearer's disagreeable breath as a result of food being trapped and decaying under their denture prosthesis. Successful placement of the Mini Dental Implant addresses and solves all of these social and practical problems. Denture patients all over the world have experienced relief from loos or fill-fitting dentures from doctors who are trained to place the MDI. 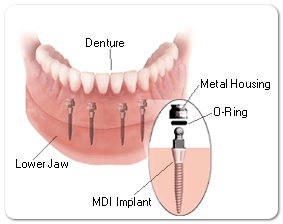 Uniquely, the MDI can be utilized to stablilze a denture in a couple of hours by a trained doctor, with the patient leaving the clinic with a stabilized prosthesis. Mini dental implants are now approved for long term replacement of missing teeth. You can throw away your removeable partial denture and not worry about cutting down healthy teeth to replace missing teeth. Immediate use of your implant, without many months of healing time and a second surgery. Implant and crown placement can be accomplished in ONE visit.